If you’re on the search for workshop matting, that you need to be both durable, safe, and reliable, then look no further than the range available here at Euro Car Parts. When in the workshop - whether it’s personal or professional - safety is of the utmost importance. 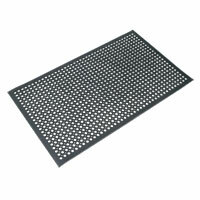 Whether you pick out some goggles to wear when drilling into metal, or invest in a fire extinguisher to keep beside you (just in case), there is something even more basic than those two tools that you could invest in to keep you and your colleagues safe when working - the trusty workshop matting. Designed to help prevent slippages, and typically constructed from high-quality vinyl, our range of workshop matting is the ideal solution to any unreliable flooring. This is especially the case if you’re likely to have an oil drip or two that could threaten your balance when walking, and if you’ve employees to consider, then you know you’ve helped do all you can to keep them safe in their workplace if you’ve opted for some workshop matting. Once you’ve made your selection, place your order and benefit from free UK delivery today. You’ll be fixing in safety in no time at all!